Nuclear Refurbishment: Did You Know? What you may not know about nuclear refurbishment: Ontario Power Generation (OPG) is requesting an unprecedented 13-year license for the continued operation and “refurbishment” of the Darlington Nuclear Generating Station. In the past, licenses OPG has received have always been for 2-5 years, maximum. This request will come before a Canadian Nuclear Safety Commission (CNSC) hearing in early November of this year. Nuclear waste is unimaginably toxic & so extraordinarily long-lived we cannot even properly get our minds around the time frames involved. This posting will provide readers with a few facts about refurbishments that they simply might not otherwise hear about. Refurbishment is a nice, innocuous-sounding word ... but what it actually means is, re-build. The 4 Darlington reactors have reached the end of their intended shelf life, & now their operators (a very large number of people paid very large salaries indeed) want to rebuild them. They could also be decommissioned, i.e., shut down, instead; that too is an option. The estimated cost of the Darlington rebuild is somewhere between $8 & $14 billion, according to not-yet-final figures projected by OPG. This massive and wildly expensive rebuild project is anticipated to take part over many years. At public expense. BUT … every nuclear project in Ontario has gone over-budget (and past projected deadlines). According to the Ontario Clean Air Alliance all past nuclear projects have gone over budget by 2 ½ times. In this case, then, the eventual cost could reach $32 billion. Taxpayers’ money. Nuclear refurbishments create a lot of NEW nuclear waste. Unfortunately, after 70 years of nuclear waste creation, no safe solution has yet been found for the storage of these 70 years’ worth of nuclear wastes. The (now former) head of OPG (the $1.8 million/year Tom Mitchell), said at a nuclear waste industry conference in September 2011, “The amount of nuclear waste in the world is expected to grow due to refurbishments, new build activity and the decommissioning of reactors.” Mr. Mitchell referred to the handling of nuclear waste as a “values-based activity” (a rather subtle way of saying there is plenty of money to be made from it). * Plenty of information about the waste issue here. This is an … explanation?? 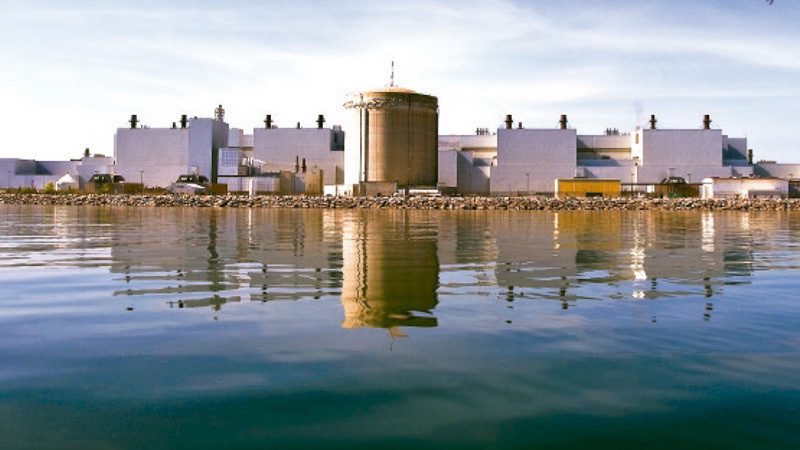 In Québec, when it was learned how costly the refurbishment of the Gentilly-2 reactor was going to be, the plant was ordered by the Québec government to be shut down. Hydro-Québec’s François Bilodeau had admitted at a nuclear industry ‘Waste Management, Decommissioning and Environmental Restoration for Canada’s Nuclear Activities’ conference held in Toronto in September 2011 that the refurbishment was expected to create 5 times as much nuclear waste as already existed at the facility. While so self-evident as to surely not even really need stating, there is no plan in place for the additional wastes that will be created if this refurbishment proceeds (or for the 70 years’ worth of waste already in existence & also lacking anywhere to be safely & reliably secured and stored). The Pickering and Darlington Nuclear Generating Stations are already host to a grand total of 1,112,860 used fuel bundles (Pickering has 667,639: 406,315 “wet” & 261,324 “dry” – or did as of June 30, 2013); & Darlington has (or rather had, as of June 30/13) 445,221 (338,510 wet; 106,711 dry). You can locate these figures in this NWMO document (in a table on pg. 3). All dressed up, as it were, & just ... absolutely no place to go. So, in Quebec the refurbishment costs & waste quantities led to an end to nuclear power in that province, while in New Brunswick, greater-than-anticipated quantities of refurbishment-created nuclear wastes at Point Lepreau led to the shipping of some to Tennessee, where it was to be incinerated … & the ash later returned to Canada. ** I learned these facts while attending a nuclear industry conference on ‘Waste Management, Decommissioning and Environmental Restoration for Canada’s Nuclear Activities’ held in Toronto from September 11-14, 2011. Learned lots at this conference! Nuclear waste is a very, very serious problem (& that is a very serious understatement!) - one to which there is as yet no solution anywhere in sight. Not here, not "there," not anywhere on the planet! To many people, it seems like a really good idea (& time) to stop creating any more of it. At the very least, speaking up about the lack of wisdom of granting OPG a 13-year license for the Darlington Nuclear Generating Station seems a highly advisable course of action. More to come on this topic soon. DGR: for so-called low & intermediate level waste: Lots of material here! and Stop the Great Lakes Nuclear Dump site (& an open letter to the Government of Ontario from 100 groups). How Prepared is Ontario for a Nuclear Accident? Answer: It’s not. Watch a 14-minute August 19th news conference about a suppressed study on nuclear disaster scenarios. 3 experts explain the study & how Canada's nuclear regulator is falling down on the job by suppressing information about real potential impacts of a serious nuclear accident. Darlington hearing, Darlington not worth the risk, Darlington refurbishment, new waste at Darlington, nuclear waste, OPG salaries, refurbishment = new waste, refurbishments create a lot more waste, should Darlington be refurbished?, suppressed report on nuclear safety, Tom Mitchell on refurbishment and waste, what does refurbishment mean?